Following on from my post on the increasing lethality of weapon systems over time , I got some interesting correspondence from Strategist reader David Goyne. He provided me with some data taken from the work of the late T.N. Dupuy, who David accurately describes as ‘a US Army officer, historian, operational analysis autodidact, and a fanatical advocate for his OA (operational analysis) method based on quantified historical data and assessment’. 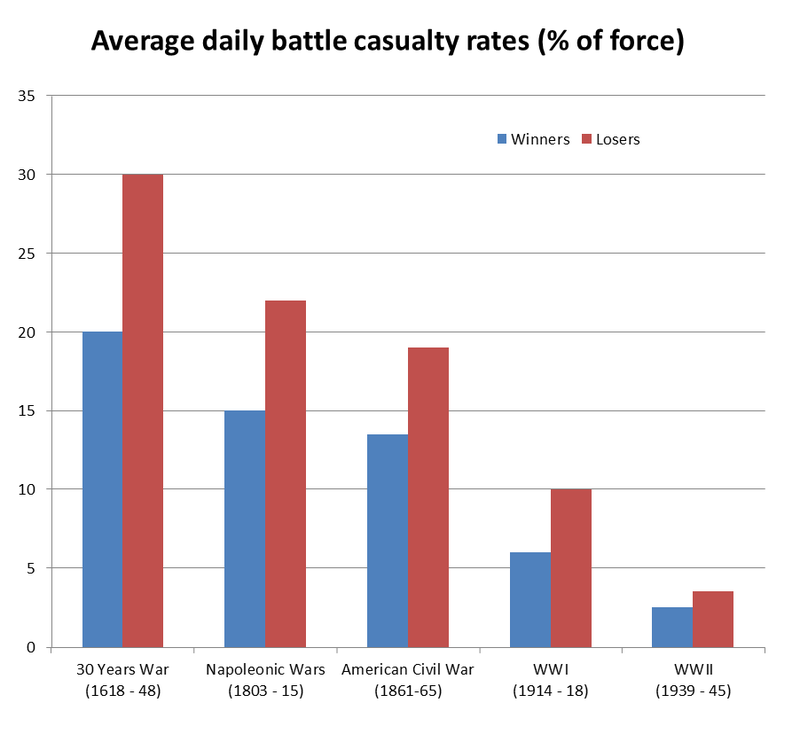 Relevant to the earlier post is Dupuy’s observation of a counter-intuitive trend—the increased lethality of weapon systems has been accompanied by a decline in the average daily casualty rates in major battles (see the graph below, source: redrawn from data in T.N. Dupuy, The Evolution of Weapons and Warfare ). The reason for this trend isn’t hard to find. As the previous post shows, forces have become increasingly dispersed in response to increases in weapons effectiveness. So while the micro effect (the chance of being killed if hit) has increased sharply, the macro effect (the total number of combatants killed) has decreased. Simply put, forces have dispersed faster than weapon systems have been able to keep up. That’s true on average, although there have been individual battles in which casualty rates have bucked the trend. For example, British forces lost 20% of their initial strength on the first day of the Somme offensive in 1916. But while that’s twice the World War I average, it wouldn’t have been too unusual fifty years earlier. As well, lower daily casualty rates meant that battles often lasted longer. The 36 day Iwo Jima battle in World War II saw the victorious US forces cumulatively suffer over 30% casualties, with the Japanese losing essentially their entire force. Seen in the light of these trends, recent wars in which the adversaries of well-equipped western forces have operated in an essentially clandestine manner most of the time are simply a continuation of a well-established trend. I now realise that the earlier post would be more accurately titled ‘Weapons are becoming more dangerous, but war is becoming safer’. Andrew Davies  is senior analyst for defence capability at ASPI and executive editor of The Strategist.